Home / Primary / Curriculum / Key Stage 2 / Transition KS2-KS3 / Global Learning Programme / Otto and Elise Hampel: Brave or Foolish? Do you stand up against something you believe is wrong, even if it might end in your death? This resource explores the actions of two people - Otto and Elise Hampel - in Berlin from 1940 to 1942. They defied the Nazis for over two years, until their arrest and execution in April 1943. This resource explores the actions of two people - Otto and Elise Hampel - in Berlin from 1940 to 1942. They defied the Nazis for over two years, until their arrest and execution in April 1943. They were so effective the Gestapo thought they were dealing with a gang of terrorists, not just two people. The activities allow students to think about strategies that will make the world more just, as well as consider the history concepts of significance and cause and consequence. It raises profound questions about our existing perceptions of Nazi Germany as a totalitarian state where people obeyed Hitler for fear of the Gestapo. Think of a time when you have had to make a very difficult decision - it might be about what to choose for GCSE, or how to decline an invitation from a friend without upsetting them. How did you set about making that decision? And what were the consequences of that decision? Spend a few minutes discussing with your neighbour what your difficult decision was and how you set about taking that difficult decision. Otto and Elise Hampel lived in Germany. He fought in World War One in the trenches and then became a factory worker. She was a domestic servant and a member of the National Socialist Women's League. They married in 1935. They were an ordinary working class couple going about their daily lives until November 1940 when Elise heard that her brother had been killed in the invasion of France. After that, their attitude to the Nazis in general, and Hitler in particular, changed. 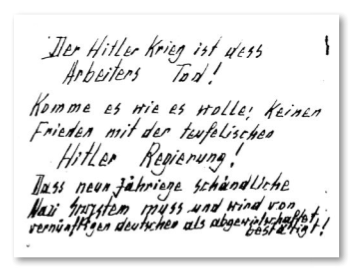 They started writing postcards and leaving them all over Berlin, scattered in the streets and other public places. They contained messages encouraging people not to co-operate with the government, to refuse to serve in the German army, and not to donate to Nazi organisations like Winter Relief. Altogether they wrote and distributed over 200 postcards and leaflets in a two year period, each time risking their lives if caught. What made these normal working people risk their lives? And how did they get away with it so long? And what does that tell us about the Gestapo, Hitler's secret police, who were supposed to have an informer in every block and eyes on every street corner? The Gestapo were convinced there was a gang of communist spies and agent dropping off the postcards all over Berlin. Eventually, by chance, they were identified and arrested in October 1942. Otto Hampel told police that he was "happy with the idea" of protesting against Hitler and his regime. Otto and Elise Hampel were sentenced to death on January 22, 1943 by the People's Court for "demoralizing the troops" and "preparation for high treason," and executed on April 8, 1943. Otto and Elise Hampel police mugshots after their arrest by the Gestapo. Why did Otto and Elise start to protest against the Nazis? How effective do you think their protests were? Evidence suggests most people who discovered the postcards were so frightened that they handed them in, unread, to the police. Why did it take the Gestapo so long to track down the Hampels? In their position, would you have acted the way they did? Explain your answer. How significant were the Hampels in the history of Germany 1933-1945? Do their activities make you re-assess the level of control the Nazi Party had over ordinary Germans? Do you think Otto and Elise Hampel were Brave or Foolish?